Bowling Green, KY's most accurate weather is now an app! Get your SKYWatch 40 weather when you want it. Our weather is forecast locally. This app does not have a feed from a national site. Our local meteorologist does all the forecasting. *Local Events (the most comprehensive list for the Bowling Green area). *News from the Bowling Green Today morning show. *Video section featuring local stories from Bowling Green Today. 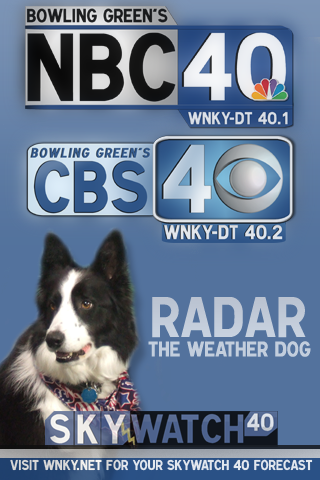 The WNKY-TV (NBC 40 and CBS 40) app focuses on Bowling Green Kentucky's local news, events and weather. Other Apps by PointAbout, Inc.